Do you know the situation that you want to show something to the audience during a presentation? For example, a terminal session. Now you need to expose your entire screen on the projector by turning on screen mirroring. This also changes your local layout, which is very uncomfortable. The other choice is moving the window to the second display. Now the projector display is usually projected behind you and it disappears on your screen. Here you cannot see what you are typing without twisting your body. Window Duplicator offers a solution for this. With Window Duplicator you no longer need to mirror your screen or twist your body, only the desired application is mirrored onto the second display. Just select the window you want in Window Duplicator. A preview is immediately visible only to you. This will ensure that this is the right window. For example, if you have multiple instances of the same application open. After verifying that it is the window you want, just press Play. The selected window will now be projected on the second display. The window is automatically adjusted on the projected screen according to the screen resolution. You can control the size on the projected screen by resizing the window on the main screen. A window on the projected screen is only reduced in size. Scaling it is up to you. [FIX] high screen resolution problem. [ADD] shortcuts for play and stop. [ADD] Mojave dark mode support. [ADD] More localizations: Spanish, French, Russian, German, Japanese. [FIX] play button is available even without any selection. [ADD] App can be minified into the menubar. [CHN] allow better app nap while Window Duplicator is paused or stopped. Does Window Duplicator work with any window? Is the duplicated window updated in real time? No, there is a small delay between the updates. So it is not suitable to play a video. Does Window Duplicator work without a second display? The purpose of Window Duplicator is to assist you during a presentation, hence it requires a second display. The play button is inactive, what is wrong? Nothing, just attach a second display to you Mac and everything will work fine. My desired window is not in the list of Window Duplicator? Most likely you launched the application after Window Duplicator. Just hit the refresh button and the list of available window is updated. You desired window should be there now. Yes! 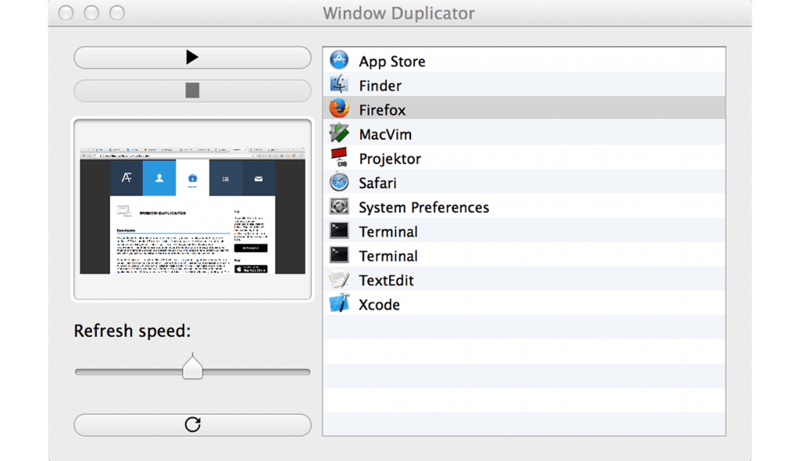 There is a special trail version to help you decide whether Window Duplicator does what you need. Great, I'm always interested in feedback. In Window Duplicator use the Feedback / Issue reporting item under Help or supply your request here. I try to get back to you as soon as possible. If you like to try before you buy, you can download a trail version below. The limitation of this version is, that projecting is stopped after a random short amount of time.